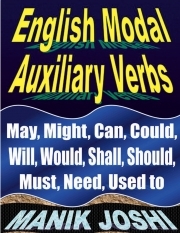 Description of "English Modal Auxiliary Verbs (eBook)"
Modal Auxiliary Verb (or ‘Modal Verb’ or ‘Modal Auxiliary’) is a verb that is used with another verb (not a modal verb) to express ability, intention, necessity, obligation, permission, possibility, probability, etc. We eat that we may live. Her prayer was that the child might live. That he might be well fed his mother starved herself. To admit that something is true before introducing another point, argument, etc. You may not return to past glory, but don't stop believing. City may not have the roads to drive sports car, but it has excellent infrastructure. It may not be wise, but using force may be lawful. I may not have deserved the house I bought, but I'm glad I own it. He may not have been loved, but he was respected. We may have had to go without food, but he is very considerate. May you live prosperous life! You may contact us for queries regarding donations. When you have finished your work you may go home. Note: ‘Might’ is the past equivalent of ‘may’ in indirect speech. But it is used in the same way as ‘may’ to talk about the present or future. If I pursued studies further, I might learn more. If I had pursued studies further, I might have learned more. ‘Might’ is very polite and formal. It is not common. It is mostly used in indirect questions. I wonder if I might work on your computer. Maybe he came to know something secret and was removed from the post. ‘May’ is mostly used in ‘formal’ English. Reviews of "English Modal Auxiliary Verbs (eBook)"